I was inspired by Elise's Shopping Alerts at Simply Recipes to let you know that a great Rachael Ray product is on sale: the Anolon® 5 Qt. Oval Covered Sauté. The pan is regularly $150 and is on sale for $84.99! Rachael designed this pot herself and now uses it all the time on her show. Whenever one of her recipes says to move all of the meat to one side and add the veggies, I think, darn! Why haven't I bought that oval pan? It is so easy for her to push stuff off to the side and add other stuff when she uses it. You may notice on Amazon that there are three bad reviews and one great one. I put on my investigator hat (meaning, I looked at their other reviews). 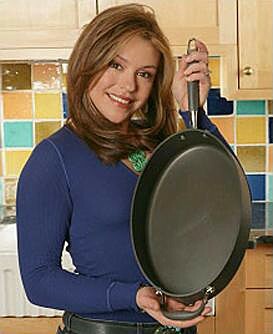 All three reviewers who did not like the pan seem to go around giving bad reviews to many RR products and include a generous amount of Rachael Ray bashing in those reviews. Coincidence? I think not. So, as with food network reviews of her recipes, sometimes people vent their dislike of Rachael through posting bad reviews. I would recommend counseling. It's a bit more expensive, but you get much better results!